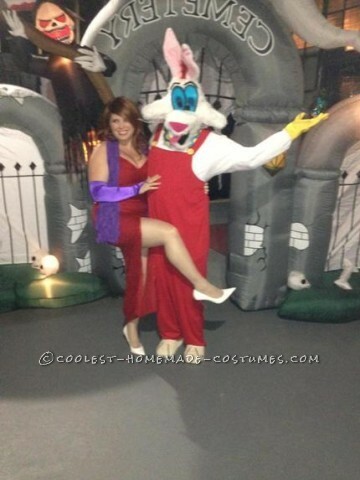 For our Halloween Costumes for 2013 we decided to be Roger and Jessica Rabbit from the movie “Who Framed Roger Rabbit” made in 1988. We love this movie and when deciding to dress up as these characters we hoped it would bring a smile to people faces and remind them of the movie as well. To our surprise people of all ages at the Halloween Party knew the characters and thought we did a great job at making the characters come to life. We were famous for the night taking pictures with our fans. It was great to bring back an oldie. For Jessica Rabbit, we searched around and found a red dress that looked similar to hers and had to critique it some. The original dress had gold beads that we had to cut off and we removed the original straps. Next, we cut some purple material to make some gloves. Then we found some shoes that would look appropriate with the dress and scarf to add a little extra flare. We then asked around and found that one of our friends had a red wig that looked similar to her hair color and length. Then we pulled up a picture and did the makeup to match. And Walla! You have Jessica. For Roger Rabbit, first I acquired the overalls with white shirt sewed together. Then we bought some yellow gloves and a bow tie from a clown set. Then we made the head. We bought some fake fur from the fabric store and cut out the shape of the head. Sewed it together and put some fluff in it. Then we made the nose and mouth out of cardboard to get the shape and then we covered it with the fake fur as well. After that, we glued it to the head. Then we made some eyeballs out of a blue plastic folder and cardboard. The cardboard made the shape of the eyes and the plastic folder was glued on top. We punched some holes in it to allow air to pass through. Then we placed them on the face to get the location, removed it and cut some eye holes. Then we went back and glued them to the face. We cut the actual eyeballs, eyebrows, nose, mouth and tongue out of felt and glued them on to the face. For the ears, we bought one that was attached to a headband originally, cut the headband off, put some wire hanger in them, and then sewed the ears to the head. We also used some of the wire hanger for whiskers and glued them to the nose. Lastly, we got some red hair we cut off of another wig and glued it to the head between the ears. For the tail, we used some of the fake fur and fluff and glued it to the back of the overalls. For the feet, we bought some white fuzzy slippers and glued black felt lines down to make the toes.